I went to the Kentucky State Fair yesterday for opening day. 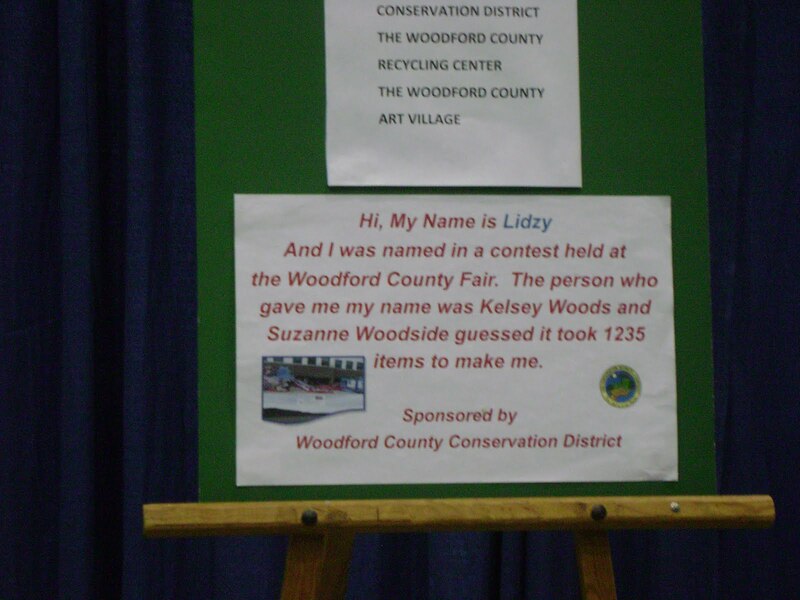 I don’t really do well in crowds but I do manage to stay all day at the fair. My SIL and I always go together on opening day. When I start to panic she knows I need to get out of the building to a quiet place for a little while and doesn’t mind this. She’s my support during a panic attack. I only took a couple of photos. I thought this was a very interesting recycled item art. 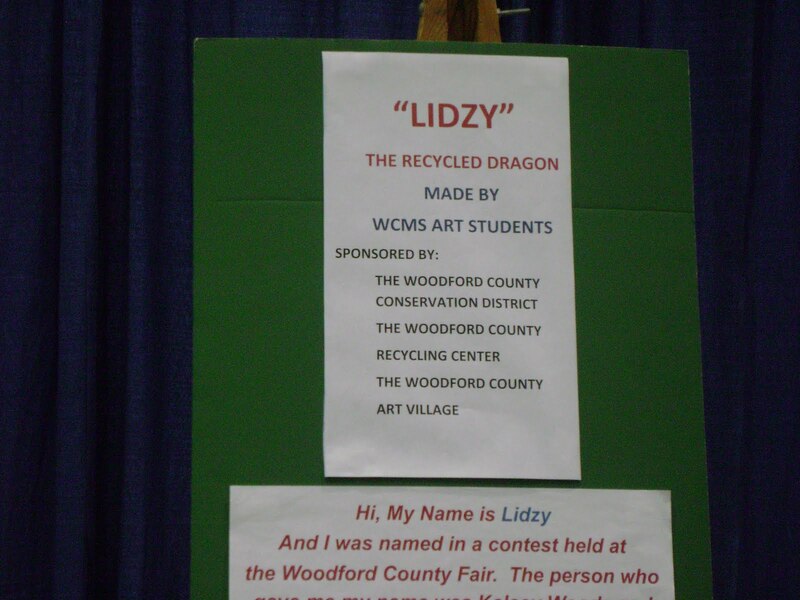 Here are the details about the piece. One art piece I finally found, that I’m very proud of, is this bird. It was done by my mother who is in a nursing home. I was going to call her to tell her about getting a second place ribbon but decided to let her get surprised when she sees it. The nursing home is taking a few residents to the fair next week for a field trip. I can hardly wait until she calls me about her ribbon. I really didn’t expect to get any ribbons on my quilts and I was surprised to get two third place. I didn’t expect ribbons because my “heart” wasn’t in the quilts. What do I mean? Well, you know how some people running a race will start off very energetic but as the race goes on they loose steam and slow down? That’s the way I was with my quilt entries. For example, the photo of Ladybug I was working on as an entry didn’t work out. I switched at the last minute to a two color instead of a 6 color one. I had very little time to finish my entry. All is not lost though. I’ve got a good head start on finishing it for next year’s fair. If I enter again. I’m not sure right now that I want to enter a quilt any more? I’ve lost my energy (steam) for running the race. It’s enough for me to just create….. for me. I’m kind of like a person that runs just for the fun of running instead of running in marathons. These days, I create because I have a desire to create and have fun with the process. Creating for the purpose of winning something has a whole different feeling to it. I call it “creative stress” because there is always stress when entering contests. Idea stress, deadline stress, and disapointment stress. Know what I mean? HURRAY on the RIBBONS. even if they are 3rd's.. THAT is great. BUT YES, the SWEEETEST one is the one your MOTHER won. how WONDERFUL. it made me grin ear to ear. We also went to our county fair today. AWFUL. very few exhibits. perhaps TEN quilts. all folded and in plastic. They did not even have the “baby animal” tent. We were there 2 hours MAX. it was SAD. 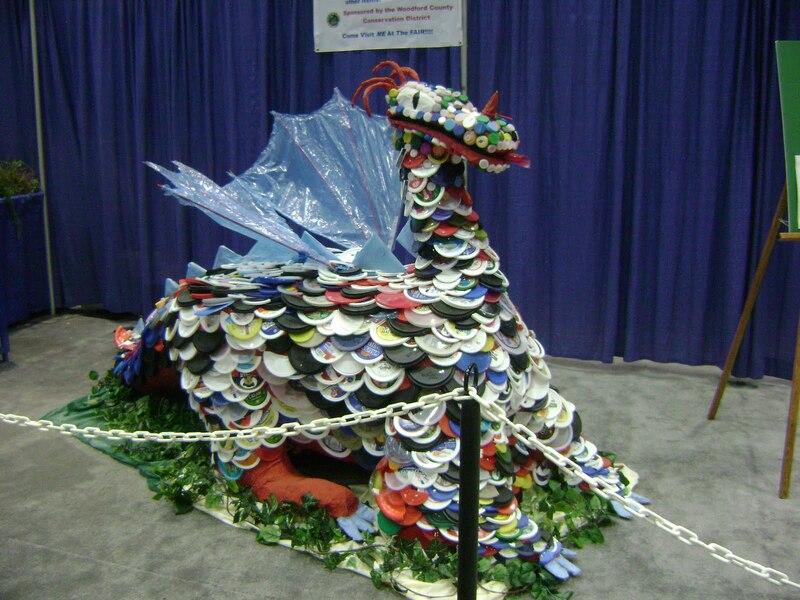 The dragon is certainly one way to use those plastic lids that pile up either in the cupboard or the landfill….but what would you do with it once the fair is over?? Congratulations on the third place ribbons on your quilts. 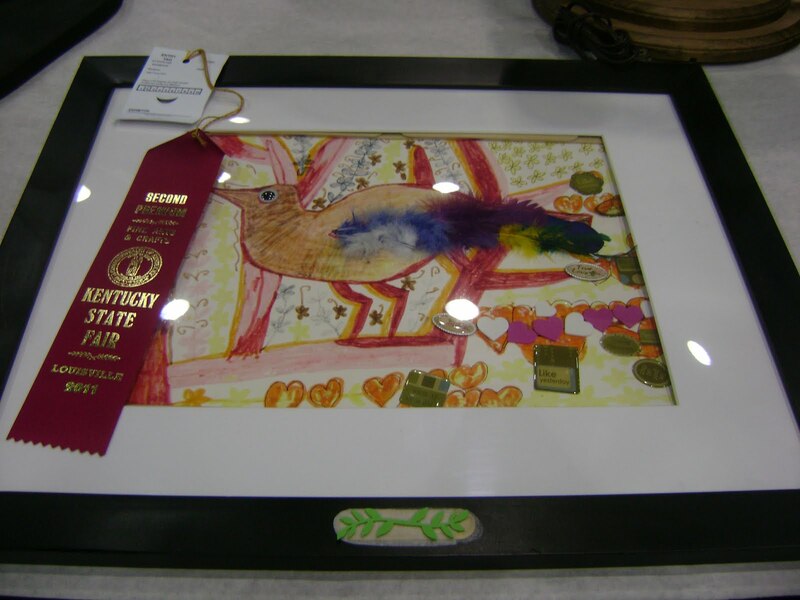 This entry was posted on August 19, 2011 by Anita in ART JOURNEY, Journey 2011.